Cheap and Easy Cooking is the ultimate cookbook for students. 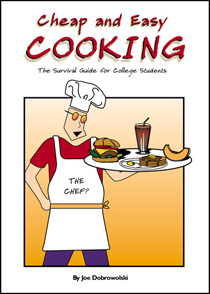 I specifically designed this cookbook with student's needs in mind. The meals are low-cost and easy-to-prepare, so they can fit into your busy schedule and tight budget. With it's efficient design, the directions are easy to read and meal preparation is a snap. It's a wonderfully designed cookbook with over 70 down-to-earth, tasty recipes that are quick, cheap, and easy to make. There are no elaborate, fancy, foreign cuisines, or 10 course meals. You will get shopping tips, a BBQ guide, and kitchen hints. All of this wrapped up in a fun format that makes cooking a breeze. What more could you ask for? It is only $5.95, and you can return the cookbook for a full refund, for any reason (no that you will want to). What do you have to lose? Want a preview? Take a look at the recipes that you will be able to create. Are you new to apartment living, or a student fresh out of the dorms; or are you just sick of spending your money on unhealthy fast food? Then here is your guide to cooking. Designed and written by a recent college graduate. This cookbook is packed with practical, down-to-earth, easy-to-use information and advice for you. You will learn basic cooking know-how, and get some shopping tips as you learn how to easily prepare low-cost, but tasty meals. This outstanding guide to food and the kitchen is helping people all over make cheap and easy meals, while learning how to cook-right now. It's the feel good cookbook of the new millennium! Designed specifically for the "non-cook"